Here in Wisconsin, the ground is thawed and farmers are gearing up for planting season. 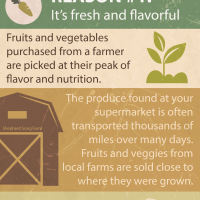 We thought it would be a good time to share some of our favorite reasons why it’s better to buy from a farmer than the grocery store. Reason #1: It’s fresh and flavorful! Whether you’re buying produce or meat, farm fresh is always best!